The Higher Education Diploma in Dental Hygiene and Dental Therapy is a 27-month course that is full time. Our graduates receive professional accreditation as dental hygienists and dental therapists. Our teaching is driven by world class research. You'll learn about the new techniques and advances that are rapidly taking place in the field of dentistry. We also believe in training the whole dental team together so you'll learn alongside dental students in a way that prepares you better for practice. Our students find the course provides them with opportunities to explore ideas, apply what they have learnt and to achieve their best. This is reflected in the National Student Survey where we consistently achieve 100 per cent overall student satisfaction. Our combination of integrated teaching and practical experience produces caring, confident professionals. Most universities train their dental hygiene and dental therapy students in one clinic. We send all our second-year students on a series of placements in primary care settings, in Yorkshire and the East Midlands. It's one of the most rigorous placement programmes in the UK. Treating patients of all ages and backgrounds in real work environments sharpens your skills and gives you a head start in your career. The course begins with a range of lectures, seminars, interactive tutorials and shadowing on clinics. Topics covered include the human body in health and disease, and law, ethics and professionalism. You'll begin clinical skills training straight away to develop the skills to treat and manage patients. You'll learn about oral disease, and health promotion and education. You'll also benefit from our 3D simulation suite where you can practise dentistry in a virtual reality environment. The second year is mainly clinical. You'll treat your own patients and work in specialist departments within the dental hospital, including paediatric dentistry, implantology, oral surgery and radiography. We'll also give you the skills to treat patients directly without a dentist's prescription. All our students plan and deliver their own scheme to promote oral health for a targeted group of people. Previous schemes were developed in primary schools and residential care homes. Towards the end of your course we will focus on important workplace issues, to give you the best possible start to your career. When you undertake clinical training in NHS hospitals you must adhere to local NHS policies including guidelines on behaviour and dress and the need to be 'bare below the elbow'. Entry is in April. You need to apply directly to the School of Clinical Dentistry, not through UCAS. The closing date for applications is the end of September. Our next expected intake is scheduled for April 2019. The provision of subsequent intakes is under review. Please see the School of Clinical Dentistry website for up-to-date information. 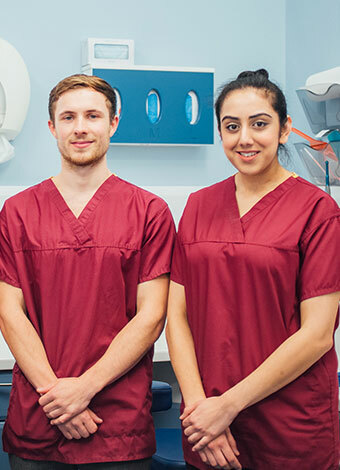 Studying Dental Hygiene and Dental Therapy at Sheffield has been a thoroughly positive experience and an excellent decision. The course not only gives you the information to do a job, but also develops you as a professional and as a person, with encouraging teaching and contemporary facilities that are second to none.